I was recently contacted by Educents and given the amazing opportunity to use, evaluate, and review their BioBubble product. I was really excited about this offer, for several reasons. First and foremost, I love animals of all shapes and sizes. Secondly, I love the idea of more teachers having classroom pets. My 5th grade classroom and a pet hamster and I loved that experience! Plus, any excuse to add some fuzzy cuteness to my life works for me!! There is so much that can be learned from caring for and watching an animal live, grow, and thrive. So, I was thrilled to say yes! 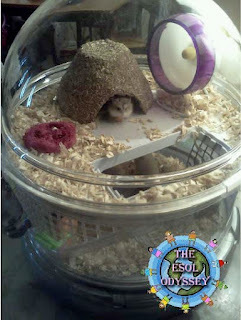 After researching their site on the BioBubbles at http://www.educents.com/, I chose the Terrarium kit for land animals, with the idea of something small, cute, and fuzzy. My husband helped me make the decision and do the research, and was just as thrilled as I was at the prospect of using the BioBubble. When the Biobubble came (in a HUGE box!) I was excited to take out all the pieces and see how they fit together. My kit came with the base, a clear riser with mesh and solid screens, a bungalow level (with a ladder and hammock), a huge wire riser, and the dome. In addition, it came equipped with most of what you need to turn it into an aquarium. After seeing how it all fit together, we headed to the pet store. 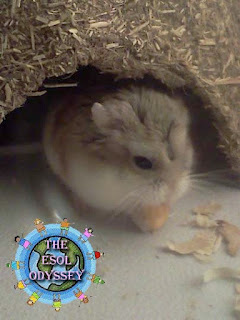 We looked at many small mammals, but finally decided to get one of the adorably cute Robo Dwarf Hamsters- the smallest variety of hamster you can get. ALL of the animals were cute, but she was super cute and super active, which we loved! I also thought her high level of activity would be entertaining for a classroom of children. She seems really happy in her new environment!! We decided to name her Roberta the Robo Hamster (what is it with teachers and alliteration?!? haha). I can't wait to share her with students this fall! Since I am an ESOL coach, I plan to develop a set of activities that my teachers can use, and we will let Roberta spend a week or two in several different classrooms throughout the year. I actually really love the design of the BioBubble, but there are also a few changes that I think could make the BioBubble better. Let me start first though, with what I love! The BioBubble lets you watch your pet from all angles, including top-down. No matter what Roberta is doing (unless she is in her privacy house or wheel) I can see her and observe her actions all the time no matter where I am in the room! It is extremely versatile. The BioBubble lets you have a lot of different options for using the same habitat for different pets- or with no pets. With the terrarium/land animal kit, we hand lots of options, from hamsters to lizards, snakes, frogs, or even birds and other small animals like mice or gerbils. You can also easily just create a terrarium environment or house insects- like butterflies (life cycle study!). Once you are done with one habitat, you can easily switch to a different type of habitat. It is very stable. We currently have our BioBubble set up in our living room. Roberta is a small rodent, and we have cats. The cats have been very interested in watching her (she seems to care less about them since she knows they can't get in). I'm confident that because of the shape and weight of the BioBubble, my cats can't knock it over. I also believe it would be less likely that children would knock it over when excited than a regular aquarium. It comes with most of what you need. Regardless of whether you are thinking of doing a small mammal, reptile, bird or amphibian, the terrarium/land animal kit has almost everything you need. All we had to buy was Roberta, plus her house, wheel, food, water botttle, food bowl, and aspen shavings. It is easy to add to and expand. Because each level of the BioBubble is secured with clips, you can get multiple risers and expand the habitat as you please. What would make BioBubble Better? Easy access option for land pets. Once your pet is in the BioBubble, there is no simple access door. Roberta seems to prefer to spend most of her time on the bungalow level where she has a built-in hammock under her house and her wheel. In order to prevent escape, we really have to wait until she decides to go to the bottom level for food or water to clean or arrange her habitat, or add food. The access process for aquatic environments is pretty brilliant and easy. However, on another token, the limited access for land-animals could discourage extremely curious children from taking the animal out of the habitat without permission. More accessories designed for the 360 environment. Because this is not a traditional small mammal habitat, we had difficulty finding a water bottle that would attach to the cage. Also, I would love to have a clear wheel that goes in the habitat so that we can watch her from all angles while she is running, too. I would also love to see some tunnels developed for small mammals that fit the access hole at the top. Roberta is definitely a tunneling animal and would love more tunnels! Since it is not a traditional habitat, we were unable to buy tunnels that would fit at the local pet store. Add comprehensive directions or suggestions for use. If I was Educents, I would send this kit to teachers with suggestions for the different types of fish (aquatic kit) or animals (land animal/terrarium kit) that are most conducive to this habitat. I would have loved to receive a booklet with more information along these lines, since this habitat is clearly not acceptable for all small animals. For some animals and fish, it is too small. Most of the really cool fish we saw at the pet store required aquariums much larger than the 3-gallon capacity of the BioBubble as an aquarium. For some of the larger small mammals or snakes, it would also be a small environment unless several clear risers and bungalow levels were added for additional space. It would be a good temporary display place for some of these animals, though. Since I've had the BioBubble myself for less than a month, I can't really speak to the durability. However, I do feel like Roberta is very happy in her new habitat. Here is a video of her running around and just being stinkin' cute! Overall, these drawbacks are small, and some could be considered as pros. If you're a classroom teacher looking for versatile animal habitat that you can use for many years and many purposes, I would highly recommend the BioBubble! Hi there! I'm your newest MD follower! This does look like a great observational habitat. From your pictures and video I'd have to agree with your concerns for Roberta's tunneling needs. Curious what pet they believe to work best.